FORAN - An organic Copper supplement fortified with Vitamin E, Manganese, Biotin and Vitamin B12. - 1 or 5 l.
Suitable for all horses, particularly mares and foals. 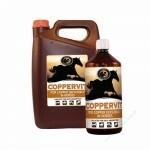 Copper has many benefits for mares and foals. Copper deficiency can occur due to dietary imbalances, high levels of molybdenum or pasture variations. Copper influences fertility in mares, elasticity of tissues and skin condition. Foals and growing horses need adequate copper for correct development of bone structure. Copper is most influential in terms of addressing developmental orthopaedic diseases when regularly supplemented via the mare from late pregnancy and up to 12 months of age. Copper enhances skin and hair condition. Instructions for use : To be mixed with feed or administered orally.